The continuing crisis of non-performing assets of the Indian banking sector has emerged almost as the theatre of the absurd. What appeared to be a problem of select public sector banks earlier has in recent times has surfaced as an ever-unfolding story. With elusive fugitive industrialists and jailed bankers, the story has elements of a B grade pot boiler Bollywood movie. The most encouraging statement in this context that one has heard in recent times is: “The worst is behind us”. Is it really? Does the chronicle of bad debt of the Indian banking sector reminds one of the story of Sisyphus in the Greek Myth where continuous efforts to take a stone uphill would invariably lead to a failure, only to be followed by similar efforts . The present note looks at this hackneyed question for the nth time. To put the records straight, let us remind ourselves that the situation has been improving till about 2009; the deterioration has started since then. 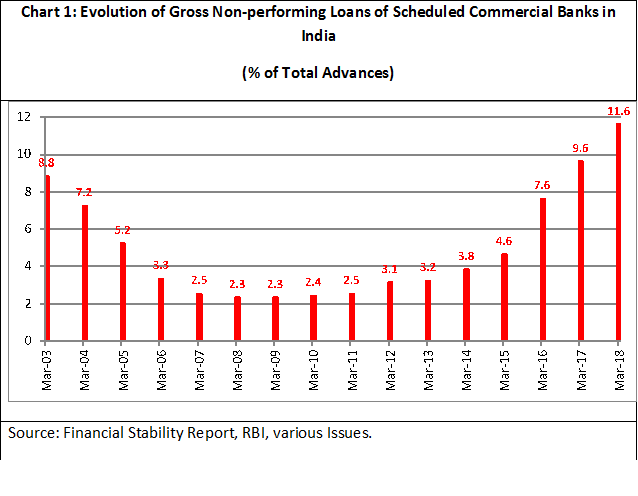 The current gross NPA of scheduled commercial banks at 11.6 per cent of aggregate advances (exceeding INR 10 trillion) is even higher than that during March 2003 (Chart 1). Thus, it seems that the banking sector is now back to the pre-financial liberalization days. What went wrong? 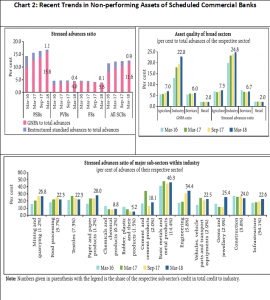 Source: Financial Stability Report, RBI, various Issues. · governance issues with the management of select public sector banks (including inadequate due diligence and charges of corruption). Two things appear from these contributory factors. First, the problem was more systemic in nature. Second, to blame all issues on a few corrupt bankers is erroneous. To put it in context, illustratively, one needs to distinguish between the issues surrounding Bhushan Steel, on the one hand, and Nirav Modi on the other. 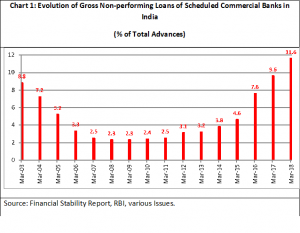 · Gross non-performing advances (GNPA) of scheduled commercial banks rose from 10.2 per cent in September 2017 to 11.6 per cent (as percentage of advances) in March 2018. · This ratio in the industry sector rose from 19.4 per cent to 22.8 per cent during the same period. The situation is case of stressed advances (i.e., GNPAs plus restructured standard advances) is far worse – it increased from 23.9 per cent to 24.8 per cent. 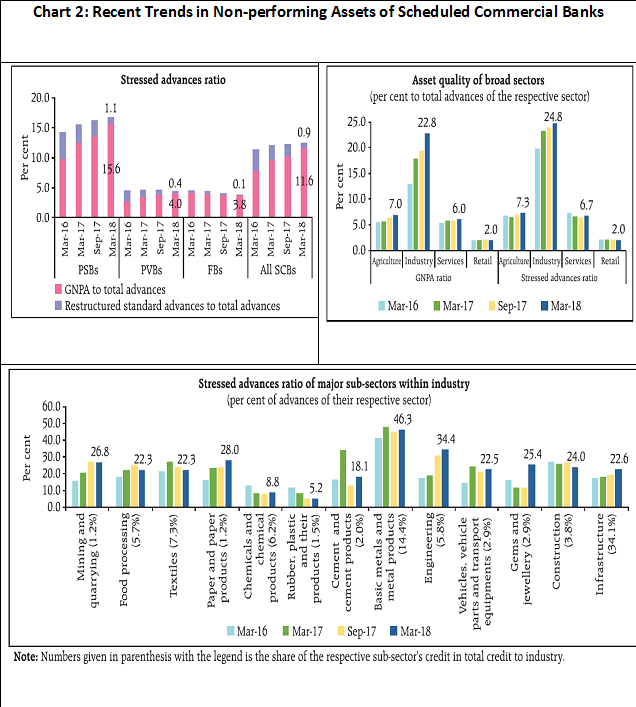 · Within industry, the stressed advances ratio of subsectors such as ‘gems and jewellery’, infrastructure’, ‘paper and paper products’, ‘cement and cement products’ and ‘engineering’ registered increase in March 2018 from their levels in September 2017. · Large borrowers accounted for lion’s share of both credit and non-performing loans. In March 2018, large borrowers accounted for 54.8 per cent of gross advances and 85.6 per cent of GNPAs. Top 100 large borrowers accounted for 15.2 per cent of gross advances and 26 per cent of GNPAs of scheduled commercial banks. Note: PSBs: Public Sector Banks; PVBs: Private Sector Banks; FBs: Foreign Banks. How far bad can it go? The stress tests done by the RBI indicate that under the baseline scenario, the GNPA ratio of all scheduled commercial banks may increase from 11.6 per cent in March 2018 to 12.2 per cent by March 2019. But, more seriously, if the macroeconomic conditions deteriorate, their GNPA ratio may increase further. Among the bank groups, the GNPA ratio of the public sector banks may increase from 15.6 per cent in March 2018 to 17.3 per cent by March 2019 under severe stress scenario, whereas the GNPA ratio of private sector banks may rise from 4.0 per cent to 5.3 per cent and FBs’ GNPA ratio might increase from 3.8 per cent to 4.8 per cent. The situation looks quite bleak. Various measures have been tried in the recent past – from Debt Recovery Tribunals, to enacting the Securitisation and Reconstruction of Financial Assets and Enforcement of Security Interest (SARFAESI) Act, 2002 – from adoption of Indradhanush Scheme for PSBs to latest Prompt Corrective Actions. But the success seems to be limited and still the malice does to seem to be going away. In fact, if press reports are to be believed, former Chief Economic Adviser Arvind Subramanian who appeared before the Parliament committee on estimates (Chairman: Shri Murli Manohar Joshi) reportedly was not convinced that the NPA issue would be resolved within a year or two. In this backdrop the high-level committee on restructuring stressed assets and creating more value for PSBs (Chairman: Sunil Mehta) generated much interest. Nevertheless, its recently submitted report could not spawn much promise. Contrary to expectations, the Committee did not propose a bad bank but highlighted a five-pronged resolution route, viz., (i) SME resolution approach (for smaller assets up to INR 50 crore); (ii) bank-led resolution approach (with asset size ranging between INR 50 to INR 500 crore); (iii) AMC/AIF led resolution approach (for large assets with exposure more than INR 500 crore with potential for turnaround); (iv) NCLT (National Company Law Tribunal) / IBC (Insolvency and Bankruptcy Code) approach; and (v) asset-trading platform. But all these measures while attempting to address the NPA problem, does not seem to be addressing the key governance issues in public sector banks. 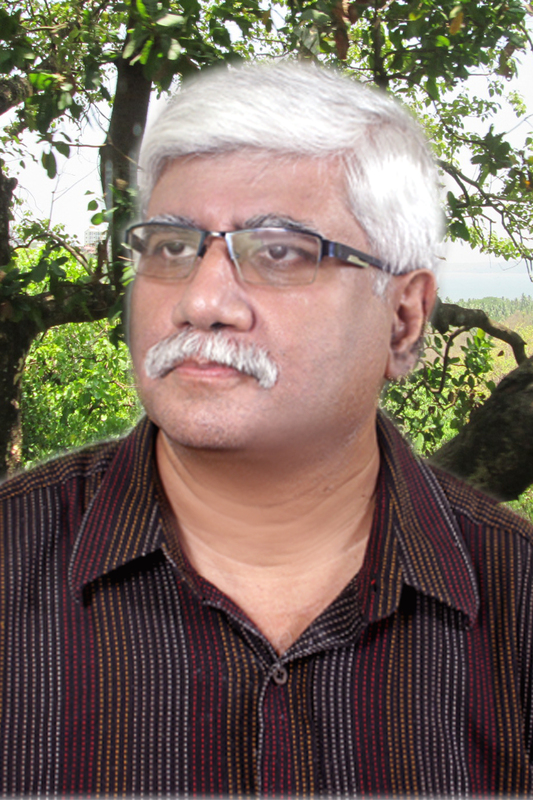 There are serious with the functioning of the recently constituted Banking Bureau Boards. All together the scenario does not look to be too promising. Measures to deal with at the surface may not yield very positive results. While expecting fundamental reforms of the banking sector at the current juncture may be foolhardy, witch-hunting the bankers is not the solution either. In fact, a situation might emerge in near future when bankers may make the easy route of investing in excess SLR securities rather than extending loans to the industrial sector. The current situation perhaps makes ones’ faith stronger in the adage “The more things change, the more they stay the same”. Mohan, Rakesh and Partha Ray (2018): “Indian Monetary Policy in the Time of Inflation Targeting and Demonetization”, Brookings India Working Paper 4, May 2018, available at https://brook.gs/2Mfm3PM.